The gutter ain't normally the place you aim for in life; but if you’ve made it into the Gutter, you've done yourself proud. 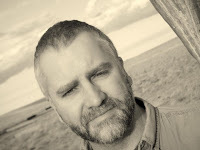 I know because over the past year, I've published 35 stories here at the Bareknuckles Pulp Dept, as well as several more in Out of the Gutter 8. And while it may seem strange to regular, good folk to be proud of these 35-plus voraciously twisted noir takes on our common reality, dammit, I am. I've been punching you in the mouth with written badassity all year long, and I hope you've got a couple loose teeth to show for it. Having said that, life commitments and my own writing are summoning me forth from my gutterish abode. I'm no longer able to devote the time necessary to bring you top-notch noir every week, and the Bareknuckles Pulp Dept is too devilishly fine a place to bring anything other than your A game. 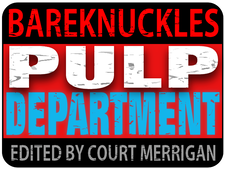 So, after discussion with my fine colleagues here at the Gutter, and with great reluctance and a bevy of morbid memories, I'm stepping down as Editor of the Bareknuckles Pulp Dept. Not to worry, though - Matt, Joe & Tom have the next steps orchestrated, and you won't have to go long without your next Bareknuckles fix. Just keep on watching this space. And I'd like to thank these fellows for keeping OOTG ticking, and wish them all the luck they could possibly use going forward. I'm not going all the way away - I'll still be dropping by the Gutter from time to time for some commentary and a book review or two. I'd like to thank all the writers I've had the privilege of working with over the past year, and all the readers that have been so good as to lay eyes upon their words, occasionally letting me know that, Hey, them's some damn good stories. I agree. Have a look right here while you wait for more to come, and thanks again for reading OOTG.